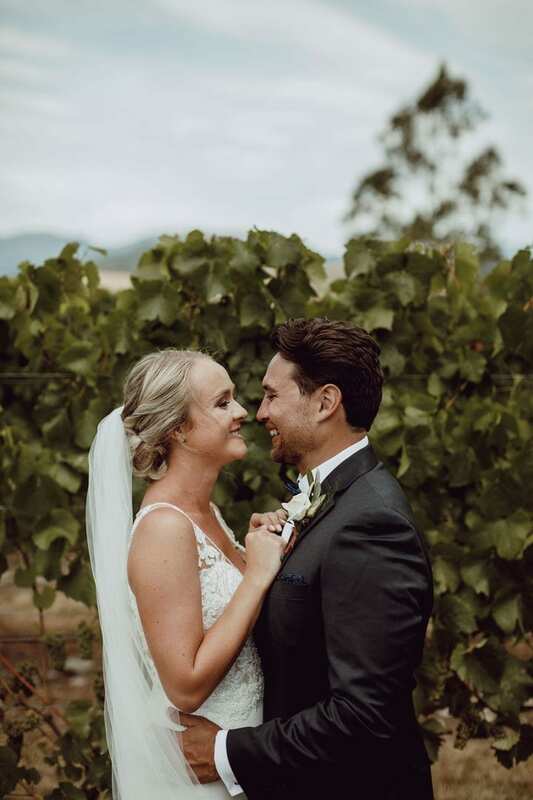 Sophie and Danny shared the magic of saying their vows in a New Zealand vineyard wedding. The family vineyard added another layer of sentimentality to the already momentous and exciting occasion. Family and and friends gathered for the duo’s special day saying ‘I do.’ under an organically styled arbor overflowing with florals. Their guests have watched the pair grow in their love for each other having met size years ago at work. Sophie working as a flight attendant and Danny a newly qualified helicopter pilot, she initially turned him down for a dinner date! Sophie kept a strict “Don’t date date anyone from work,” policy. After a little to-ing and fro-ing, she finally said ‘Yes.’ And the rest is history. As their relationship grew, they experienced the struggle of managing long distance. “When we moved Dan’s new job required him to work away a lot. He would be away for 6-8 weeks, then home for a few weeks before he left again. At the time, this was really hard. But looking back at it now, this is what made us really strong as a couple,” Sophie explains. The strength of their love is undeniable with smiles plastered across their faces following the ceremony. The joy flowed into the evening with exceptionally thoughtful and funny speeches and as the newlyweds hit their dance floor under the stars – both highlights of Sophie’s recollection of the day. Adorned in fine crepe and beading, our stunning bride Sophie wore Erandi by Spanish label Pronovias. She loved the feeling she had as soon as she tried it on. “I tried on so many dresses and my White Lily gown was one of the first. There were no other dresses that made me feel like myself, yet also a confident bride. The girls at White Lily made the whole process of finding a dress really beautiful, they were all so friendly and excited to experience the process with me.” She says. Danny was equally as dashing in a black fitted suit layered with traditional attire for the ceremony and topped up with a maroon-wrapped boutionerre to match Sophie’s bridesmaids. The advice our beautiful bride would give to others? Having both recently started new jobs, the pair are currently looking forward to potentially honeymooning in the Caribbean! See more from inside their big day below! Big Bad Wolf Carpentry – Chris made our beautiful wedding arch in my parents garden.